New Delhi, April 15: The Election Commission of India (EC) had emphasised on the date of announcing the schedule for the 2019 Lok Sabha Elections that the Model Code of Conduct will come into place from immediate effect from April 15, 2019. However, a recent incident involving a railway passenger proves that the model code of conduct is not being followed in earnest. Model Code of Conduct Comes Into Force Ahead of Lok Sabha Elections 2019: What is MCC or Aachar Sanhita? Why It's Needed & How is it Enforced? All You Need to Know. 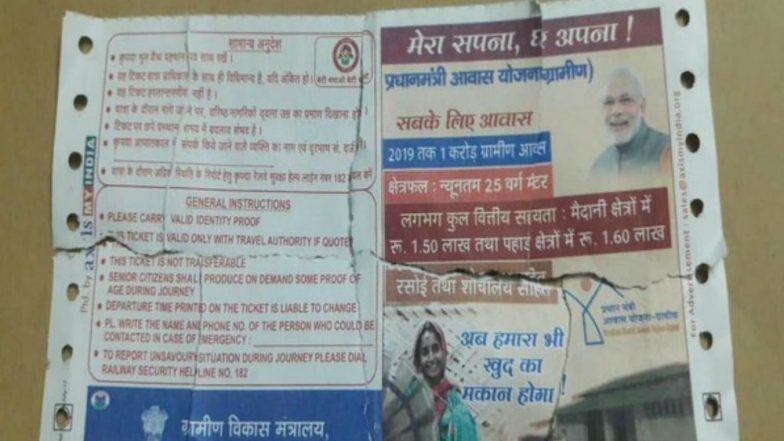 The incident took place in Barabanki, Uttar Pradesh, where a railway passenger was scolded for complaining that the ticket carried a picture of PM Narendra Modi and that it was not right as it is election time and the model code of conduct is in effect. Model Code Of Conduct And Lok Sabha Elections 2019: Are All Political Parties Blatantly Disrespecting Aachar Sanhita? The man then approached the media and shared the ticket in question. The ticket does show the photo of PM Narendra Modi at the back with PM Awaas (Rural) scheme. The Election Commission (EC) had recently instructed the Indian Railways to stop printing the image of the Prime Minister on Railway tickets till the completion of the 2019 Lok Sabha Elections, after the Opposition parties had complained. In a similar incident, passengers in the trains were served tea in a cup which contained photo of PM Narendra Modi. The incident took place on a Shatabdi train in paper cups with the line "Main Bhi Chowkidar (I'm also watchman)", written on the cups. After complaints, the railway then withdrew the cups and fined the railway contractors.